Salam, VA: After the opening round of the Virginia State Wrestling Championship on Friday, Feb., 19th Fauquier went 6 and 2 with 4 pins as they rest in first place 39.5 points. Fauquier was the only 4A team in the state to advance six wrestlers onto the Semi-Finals. The second place teams at this point was Great Bridge who advanced five wrestlers and had 26.5 point followed by Hanover with 25 points. By winning the opening round teams would earn 3 points for placement points - plus advance points and bonus points for a maximum of 7 points. Round one had the Falcons starting off with (113) Kyle Budd earning a pin in 52 seconds over Zeph Frankart - Louisa County. Then (126) Ty Foster, (138) Kyle Roche, and Senior (160) Garrett Tingen also recording pins respectively in their bouts as well. Senior (145) Caleb Strum won by TF 16-1 match over Aaron Daugherty - Grafton as (170) Clifford Harrison also was victorious in a close 4-0 match over Zac Brown - Eastern View to close out this opening round. The Harrison match was a key head-to-head bout with Eastern View to advance these six Fauquier wrestlers onto the Semi-Finals. As round one of the consolations concluded Eastern View who had seven wrestlers on the back side of the state meet and ran the table winning those matches to jumped the field to first place. As team Fauquier who still rest with 39.5 points and now in second place to Eastern View who had 51.5 points. 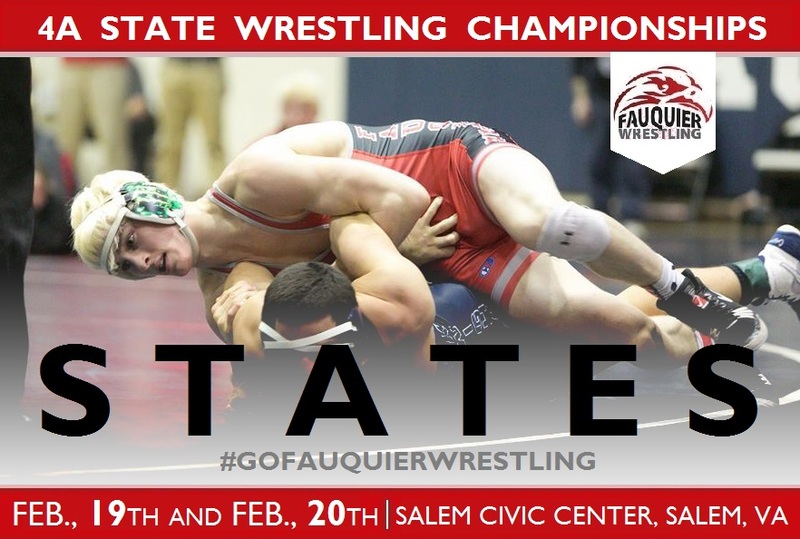 As the Salem Civic Center venue cleared in between the rounds and the Semi-Finals started at 6pm on Friday night the six Falcons had to come out strong if they were going to have a chance to stay in the hunt. 113 lbs Kyle Budd won a very tight match 1-0 over DJ Ahalt - Courtland. Budd was able to escape second period for a point and rode Ahalt the entire third period to steal the win. Ahalt was the defining State Champion from last year as Budd lost to him in the State Finals. 138 lbs Roche won a thrilling OT 8-6 match over Reggie Montion - Handover. Roche was able to score a two point take down at the end of the first period to earn a 2-0 lead. Second period Roche let Monton up for one escape as Roche was able to again earn a takedown. Monton was then able to earn an escape to end the second period 4-2. Roche started in the down position as Monton let Roche up and with a minute left to boost the score to 5-2. But within the last 30 seconds of the match Monton took Roche down twice to tie it up and send match into overtime. Roche was able to get in on a take 30 seconds into the overtime play and score to win end the match. 160 lbs Garrett Tingen won by pin over Ron Bell - King George. Tingen scored the first takedown and a set of back points within the first minute. As Tingen worked for another pinning combination and time was running down in the first period Tingen was able to record a first period pin at the 1:59 mark. 170lb Clifford Harrison won 4-3 over Garrett Moody - Freedom. Harrison wrestling Moody twice already this season and had spilt those matches with Moody. Through the first period of wrestling the match was tied 0-0. As the start of the second period Harrison started down and earned an escape to go up 1-0. Moody then took Harrison down as Harrison then escape to close out the period 2-2. Moody also took the down position to start the third period and was able to escape as Harrison has able to get in on a takedown on Moody the last few seconds of the match for the 4-3 win. Fauquier pushed four wrestlers into the 4A Championship Finals and having Garrett Tingen recording a pin was the factor why Fauquier stands on top of the leader board the start of day 2. With six Fauquier wrestlers still alive to earn team points the Falcons will need to continue to have wrestlers win matches as team will battle for the State title today. 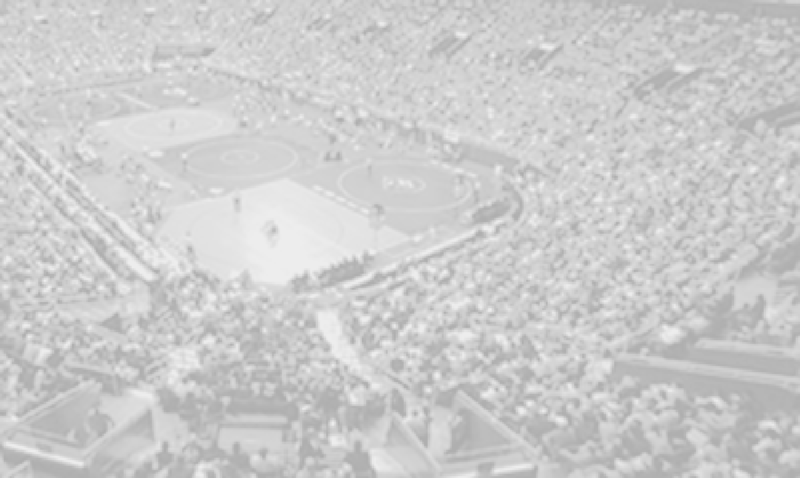 Wrestling will start today with the Consolations Semi-Finals at 9am as the Finals are set for 3pm.